A few weeks ago I received an alumni fund letter from the College of Environmental Design (CED) at UC Berkeley. Included in the letter was a well-designed leaflet about the re-oaking Oakland project undertaken by ProfessorsWalter Hood and Ron Rael and their design students. I enjoyed reading about this community and academic effort and was happy that the school was sharing this work with its alumni. The story has gone beyond CED in the form of a New York Times article by Patricia Leigh Brown, who mostly writes features about California issues and landscapes. Read the Times article, Tree Project Aims to Put the Oak Back in Oakland. 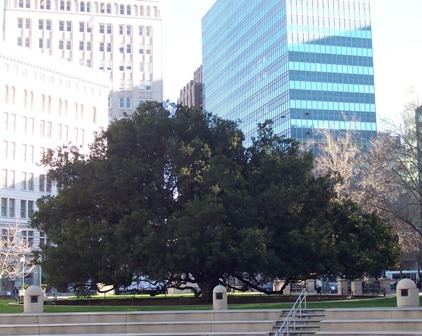 The coast live oak was one of the dominant tree species of Oakland's historic urban forest canopy. Many factors led to the species' population decline as well as that of the city's overall canopy cover. 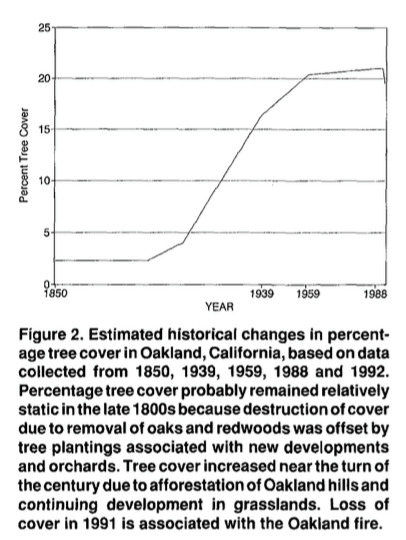 David Nowak's 1993 research article in the Journal of Arboriculture provides a fascinating historical and statistical account of Oakland's changing canopy. The coast live oak is one of several native oaks of the East Bay. Watch a video about The Oaks of Oakland. I you own or manage a California oak woodland, the University of California has published a management guide to Living Among The Oaks. View images of the dramatic coast live oak here.